Your health and wellbeing should be important to you. Health care professionals can help keep you on the right track, but it is also possible for you to take charge of your own health using current technology and the Internet. Indeed, you don’t need to be a nurse or a doctor to find good information about how to take better care of yourself. All you need is Facebook. Here are 25 Facebook apps that can help you improve your health. Exercise can help you keep your body in working condition. Keep track of your fitness routine, create your own workouts and share your progress with these Facebook apps. Shapelink.com fitness log: This application lets you keep track of your fitness efforts, and share them on your wall automatically. You can keep track of your fitness information, including your progress, on Facebook. You do have to sign up for Shapelink.com in order to use the app, but as a member you get detailed information on your workouts. 24 Hour Fitness Get Fit Motivator: Get help with your fitness motivation, from 24 Hour Fitness. Choose a fitness goal, and then design a plan to reach that goal. You can easily track your progress and share your results with your friends. easy fitness log: This application offers an easy log for your workouts and fitness progress. Compare what you are doing to your goals, and share your progress on Facebook. Get Up! Get Out! Get Moving! Exercise Now! : This Facebook app is designed to motivate you to get moving with fitness tips and tracking. There is a special emphasis on bone strengthening exercise, as this one is developed by the American Academy of Orthopaedic Surgeons. Fit-ify! Exercise Tracker: Make health and fitness goals, and create a plan. You can track your efforts in aerobics, cycling, swimming, running and more. Get your friends involved and share your progress. LogYourRun.com Facebook application: Keep track of miles, pace and more when you use this Facebook app. Allows you to decide who you share information with, and which events are made public. What you eat can have a big impact on how you feel and how healthy you are. These Facebook apps can help you keep track of your nutrition goals and what you put into your body, leading to a healthier you. 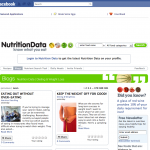 Nutrition Data: The famous Nutrition Data blog offers a Facebook app that helps you keep track of what is actually in your food, as well as provides healthy recipes. My Diet: This Facebook app allows you to succeed in changing your nutrition habits, with a diary to help you keep track of your calorie intack, and help you record your progress. This is from the folks at Fat Secret. Diet & Calorie Counter: Keep track of your daily caloric intake with this app. Get nutrition information about what you are eating to help you make smarter decisions. Calorie Counter: Keep track of your calories, monitor your water intake (important for nutrition) and log your weight. A great way to enhance your nutrition choices. Food: Share your love of food. Includes recipes, nutrition information and restaurants. Find what you’re looking for. There is a connection between your mind and body. You can improve your health with a better mindset, and by working to reduce stress and anxiety. Here are some apps that can help you strengthen the connection between mind and body, and help you with emotional and mental health. More Brain Exercise: Keep your brain sharp with this helpful and fun app from Namco Bandai. Play games designed to help keep your brain active and healthy. 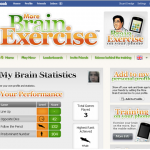 Mind Games: You can play these mind games to help you keep your brain sharp and healthy. Yoga: This application helps you with your mind/body exercising so that you can relieve stress and feel healthy. Heart of Buddha: Find some inspirational quotes to enhance your Buddhist meditation practice. Zen Meditation Chimes: You can add this to your Facebook page or profile, and hear a chime that can help you relax and focus your meditation. Part of a healthy mind and emotional state is developing healthy relationships. These Facebook apps aimed at relationships can help you develop relationships that can help enhance your overall health. Dopplr: Use this application to keep up with others around the world. Make travel plans and see old friends. Schedule trips with loved ones and friends. 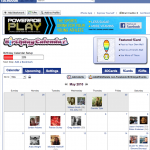 Birthday Calendar: Remember important dates and keep in touch with friends and family. Keep your relationships happy. Hugs: Provide long distance love and support, or just let someone in your life know you care. You can send hugs and receive them, and feel better knowing that you are loved. NaughtyNotes: Keep that spark in your relationship with NaughtyNotes. Can be private or public, but it can help you develop passion with your significant other. Neighborhoods: Get to know people in your area. Develop new friendships and enjoy social interaction with this Facebook app that helps you meet people in real life. If you are interested in health care reform, and in figuring out where you stand on your own health, there are Facebook apps for that. You can learn more about health care reform, take quizzes to help you figure out how healthy you really are, or learn about a variety of different topics. LiveHealthClub: Ask questions and get answers. This Facebook app features a forum in which you can ask questions on a variety of health topics, and get answers. Also includes helpful information on fitness, nutrition, relationships and other health issues. 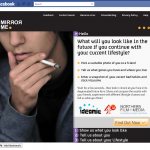 Mirror Me: Get an idea of what you will look like in the future if you continue your health habits. Use a photo of yourself, answer a quiz about your health, and see what your future holds. Health Care Reform App: This Facebook app from the White House offers a simple quiz that will tell you exactly how health care reform will affect you. Health Quiz: Take different health quizzes related to different health concerns. Learn more about your health, and how you can improve it. This entry was posted in Health, Lifestyle and tagged Calorie, Facebook, Fitness, Health, Nutrition. Bookmark the permalink.